We have partnered with Affirm to give you a simple way to buy the lawn sweeper or leaf blower you need now and pay for it later. 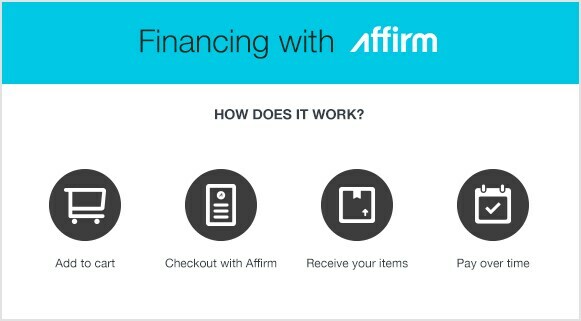 Affirm is a financing alternative to credit cards and other credit payment products. Affirm offers instant for purchases online. With Affirm, you can buy and receive your purchase now, and pay for it in fixed monthly installments over the course of three, six, or twelve months. Leaf Blower Financing With Affirm - View Our Shop Leaf Blowers Now and Pay Later With Affirm. Our leaf blower how-to library can help you pick the perfect leaf blower, walk behind leafblower, cordless leafblower, battery powered leaf blower or leaf blower accessory.